1, In line four of Rule six the word "manufactured"
rood and two poles more or less being parts of Lot Nco. as shown and described in the plan referred to below. in the Registrar's Office on the 7th day of April, 1913. Now KNOW YE 1hat I CHARLES (i]I ..I. ,i .
on behalf of His Majesty. and Sick Leave of Public Officers. determine; but not to exceed one half of his salary. on the 23rd day of June, 1908, are hereby repealed. of the Prison of St. Vincent. said Rules relating to the Dietary Scale. far as possible without bone". "regulated by the Dietary Scale and by Rule No. 268". May should this year be held on 24th May, 191i8. To all to -',rIo,& f/,,'se presents shall come, Greeting! Colonies which aor parties to th.- Agreement. an Ordinance No. 2 of t1;' of the Legi.slature of St.
to amend the.Custouis Drties Ordinance, ;895". AND WHEREAS by section 5 of the sid Ordinance No. the Second day of June, 191:3. E / and its Dependencies, fc., -c., A 6'r. to be named hy the Governor by Proclamation. come into operation on the 4th day of June, 1913.
year of His Majesty's reign. The Customs Preferential Duties Ordinance, 1913.
iBrit i; Colonies entitled to benefits of Pri f, rnifjl a rrif. Fish, dried, salted, or smoked. Meats, fresh, and poultry (dead). Bread and biscuits of all kinds. Beans and peas. whole or split. Iron and steel nails, spikes, rivets, and clinches. dental appliances of all kinds. Vehicles, including automobiles and motor cars. Paper of all kinds and manufactures of paper. Nickel plated, gilt or electroplated ware. Linseed oil cake and linseed oil cake meal. country of produce or manufacture. entitled to admission at preferential rates of duty. expiry of six months from the date of its issue. for use are specified in Schedules "B" and "C". production of the certificate of origin. shall be filed with the papers of the importing vessel. tariff shall be packed separately from other goods. purposes of consignment or re-consignment to St.
country or Colony as aforesaid. not be entered on entries along with non-preferred. or other official authorised to administer oaths, and in. by the exporter, which merchandise is to be shipped. value of every such article in its present condition. bto declared unuer imy responsibility. months from date of issue). (I1 Country of origin or manufacture. (*2i Port of ultimate destination. Authorities at the preferential rate of duty. Authorities at the difference in. be and remain in full force and virtue. under the British Preferential Tariff. in the form appended hereto. ninriff bhall be pa, k.: separately from other goods. Of goods entitled to Preferential Treatment under ti- (,,l-a. To be attested to before a Collector or other pr'int ip,! of the British Preferential Tariff. So declared under my responsibility. goods are re-exspirted frmni a Briti-h Colony into St.
any other officer appointed for that purpose. a chain around either bank thereof. cultivation of an existing tenant on the land. 100 feet by 50 feet. when determining the value of the whole. its number clearly displayed on some part of it. each allotment shall be recorded in the Register. of land without the instructions of the Governor. considered eligible by the Governor. paid or the allotment forfeited. ment without the consent of the Governor. on such selected line of road. immediately report al the facts of the case to the Gov. i. thi' ipovisionus of the said Ordinance. It, iztrar'.s Offin ftiep of all (.oit to the alluttee. said Districts is hereby revoked. by lands of the said Biabou Social Union". u1 Hi, MH j,.,ty .-ign. 1,,....,tt C ..,! C. .', i..'. in the said Island of Saint Vincent. by the North Union River. direction until it touches on the Public Highway. hereby proclaim make known and d.,lare to all th,. on behalf of His Majestv. S. Island of Saint Vineent and its Depen. dencice, 'c., fc., f .
2ad day of August, 1913. Beans and peas, whole or split. Paper of all kinds and manufactures o! paper. country of origin or manufacture. Seal of Office, if any. months from the date of issue. of the certificate of origin. tM preferential treatment unless the Customs Authori. the preferential goods specified in such entry. June, 1913, shall be repealed. one.-f.rthi oif the value of ,very such artidl,:' in it. Name and address of exporter. rk mbers.a descriptn uanta. Vduc. So certified under my responsibility. (Oiciil. gi ing rank ,ii the case may be. I Country of uorgin or manufacture. I") Port of ultimate destination. Ilarks. |Number. ages anddescription Quantity. Value. (1) Port of ultimate destination. cotitinuous Customs sul'ertiinu w hilht in Country of Origin. agreement in terms of Re.hedule IV to the Odinancf-. approved by the Governor in Council. appended to be known as Form V.
Treasurer, Secretary or Trustee of a Society.
. referred to him by the Governor. AGnilIC'LTULAL CREDIT SoCIETIFE- ORDINA.N E 1913. Tuo /r .fri-grar- at the Court House, Kingistown. under section 9 of the said Ordinance. 2. I enclose order for five shillings as registration fee. section 18 oif the Ordinance. busine s of the So- ? of Treasurer. ....... .. .
not exceeding 20 gallons ..
For every Case, Basket or other \ . in lieu of such half p2nny. being warehoused, per week ..
For every Hogshead ,, ,, ..
and its Dependencies, -e., Se., &'c. To all to whom these presents shall come, Greeting ! to be named by the Governor Ly Proclama'ion. the 4th day of September, 191.3. ST. VINCENT GOVERNMENT COTTON GINNERY. from 7 a.m. until 5 p m.
The Manager, Government Cotton Ginnery, Kingstown. will not be held responsible for unmarked bags. shall be at the rate of $6.00 per ton. to settle their accounts monthly. daily from 7 a m. to 3 p.m.
merged in the general purchase account. 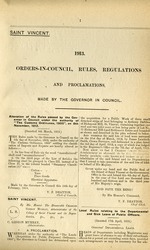 the Government Gazette during the Ginning season. A copy of such schedule shall be posted at the Ginnery. the Pass Book is produced. ing the name of the grower, the place on which it is . grown, and the weight of the cotton. it is intended to ship such cotton. the 27th day of May, 1911, are hireby repealed. or COTTON AT THE GOVERNMENT CENTRAL GUNNERY. entitleil t.- gratuit,,u. nieodical aid. any kindl worth more than 50. 2. All former tables of fees are hereby repealed. as a Bank Holiday thrugiihli.nt th. C,(l.onv. Holiday throughout t h. Col,,ny. "member in respect to such remuneration". "for re-election on the expiry of their t-rm ru of office. "remuneration under any conditions whatever". "dptermnined by the menil.er. at a gne.ial mn?:-ting. Ordinance, No. 9 of 1910. "The funds for payment ot such r:imunie-ration inayti i"
Society, hall hbe added to Schedule II of the Rule.-i. Tar A:,.RICiLITRAL CREDIT SOCIETIES OiDI NANCE, 1913. SAINT VINCENT. owner or occupi.-r 1-f a dairy. 2. Every dairi-Ymnn ,hall take out a li'ence annually. (as surety on behalf of the said interest so to do. firmly bound to the present Administrator of this any renewal thereof. WHEREAS the above-bounden hath been duly appointed dairy produce. of the said Society established as aforesaid, and he, 5. The licence shall not he transferable. of of the said Society established as aforesaid, and shallmay be readily identified. for such payments and likewise shall and do in all respects well period of his licence. [Seal]. Sanitary Officer, JuitiLe if the Pear-e or Constable. in the presence of ing milk to the custome.i- ot a dairyman, not having. 'AME. NAME. a badge, or reifuiing or neglecting to show the same to . Signed sealed and delivered by the above-named-be liable to a pmnnlry nt exceeding fve pounds. NAME. NAME. plying pure andl inadulteiatepd milk. returned to, and rtnine I by the Local Authority. October, 1913. obtained on paymeinnt .1 th.e -;um of I1-. 13. Any petion tound guilty by a Magistrate of a .
Cal.iaqua, Layiou, Barrouallie, and Cihateau'jelair. of milk collection and storage. W HEREAS it is meet that a day should he set . the fourth year of His Majesty's reign. a penalty not (xceeding twenty pounds. "as an ordinary creditor would be entitled to do". "may or may not be a member of the Socio-ty". ments" in the first line thereof. _____ Acting Clerk (f Councils. cn the 14th October, 1913 (Vide Gazette of 16th October 1913). Small Towns Regulation Ordinance, 1878". year current at the date of issue. under his hand to receive the same;- s.
For every turtle under 20 lbs. ,. slt day of January, 191-1.
sale, and for the control of bakeries. all kinds of fancy bread, whatsoever. pared for purpose of sale. the Small Towns aforesaid as the case may be. to have come into force. Sanitary Authority may in each case approve. be guilty of an offence against this Regulation. from using the premises as a bakery. medical practitioner a certificate of health. hereof that any articles or materials used or apparently I materials to be destroyed. nsch Medical Officer -;hall certify in writing that the for any term not exceeding one month. in the manufacture of bread shall cau.e such articles or I shall come into foice on the lat day of January, 1914.
nionths from date of issue. I hereby certify that of . is in a fit'state of health to be employed as a baker. Made by the General Health Authority this llth day of November, 1913.